Oh, lovely! Can I direct you to my own meditation about the Sacred Heart? 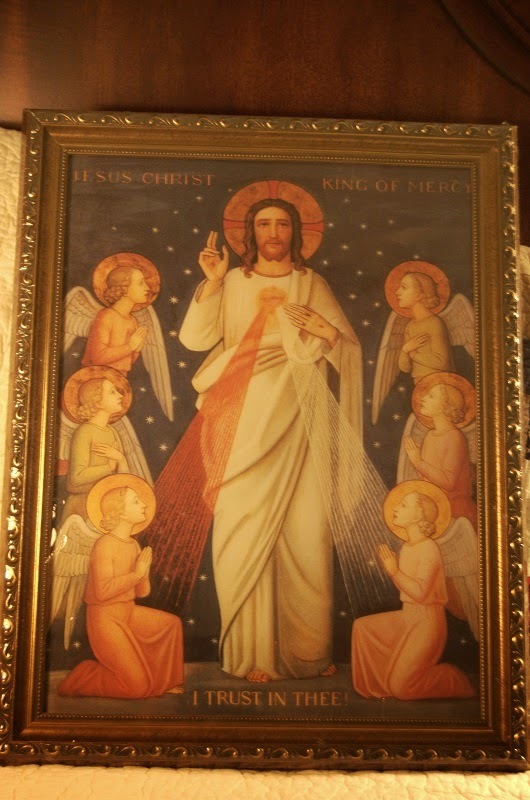 That's my favorite Divine Mercy image too. A couple of years ago I got St Claude de la Colombiere, who was St Margaret Mary Alacoque's confessor and who helped to promote the devotion to the Sacred Heart. So I did some delving into the Sacred Heart devotion myself, it's not one that has ever appealed to me. I love bearing's post, but here are a few things I have blogged about the Sacred Heart, maybe one of them will be helpful too. I don't know if you could get a badge for the saint or not; I always just Google Imaged something. I need to update my blog sidebar. Thanks for the links! I have never really given much thought to the Sacred Heart devotion. My grandma had a picture in the kitchen. You know, standard. I grew up almost complete devoid of knowledge of the concept of devotions so it still feels alien to me. bearing, that Ezekiel verse is also one of my favorites. I am very prone to shutting out emotions and coldly, numbly doing what needs done. It is a reminder to me that I should want a heart of flesh and sometimes, that flesh is painful, but pain doesn't necessarily mean bad. So I am looking forward to learning more this year in my own roundabout way.